Fragmented and Controlled by a "Certain Few"
The “Smart Home” has always had the potential to unleash unprecedented value for comfort and convenience as well as safety and security. The sheer volume of manufacturers, service providers and tech companies addressing the residential arena is a testament to its potential. However, today’s smart home market remains fragmented with competing networking standards, a myriad of hubs that claim to control just about everything you can imagine in a home, and legacy entrenched technology focused on home security, energy, media services and well, you name it. Today’s Smart Home is utterly dominated by Smart Home hubs such as Amazon Alexa and Google Home, with other technology suppliers trying to either break up or break into these partnerships and ecosystems. However, in order for the Smart Home opportunity to reach its full potential, there must be a shift from these “hub and spoke” ecosystems with new devices randomly proliferating from these hubs to a more logical and orderly smarter residential experience organized around specific domains, applications and use cases such as food and cooking within the kitchen domain or entertainment within the living room domain. As the arms race for the Smart Home continues to heat up between Amazon and Google, there are several implications that will likely hurt the overall adoption of Smart Home technologies. Just ask yourself, how likely is it that any of these smart hubs will really address improving user and customer experience? For the Smart Home opportunity to reach a mature state, several collaborative technology developments will be required. 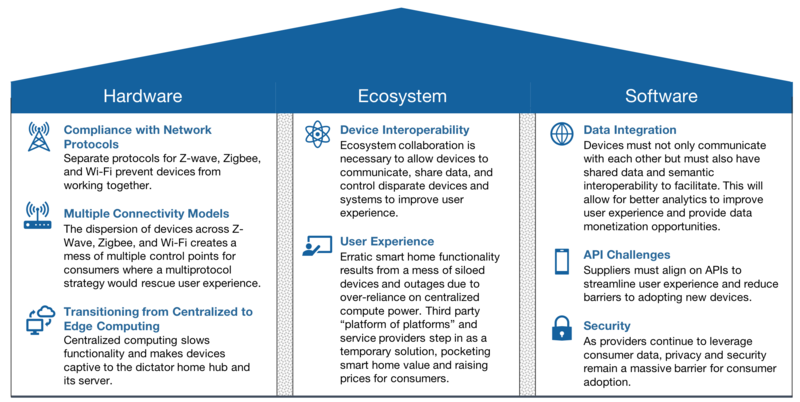 Two examples come to mind: interoperable application focused “mesh ecosystems” to foster unique device interactions within a specific application domain, and an increase in [real] edge computing capabilities for home devices. Edge computing will ensure that when devices lose connectivity they will still have local intelligence and will be able to execute their required tasks (a smart lock, for example, that will still unlock your door without requiring a cloud connection). Application focused “mesh ecosystems” to enable device-to-device communication within their app domain (such as a “white goods” or kitchen domain that includes microwave, refrigerator, dishwasher, etc.) and enable system-to-system communications across smart home app domains (cooking/eating, security, entertainment, etc. ), unlocking new application values currently inhibited by the “hub and spoke” players. Smart Home platform vendors that provide the backend connections and enable consumer-facing applications are in a unique position to facilitate collaboration. While consumers continue to patiently wait for suppliers to deliver deeper smart home value, device fatigue is signaling a demand for better experiences. Given the diversity of players and the complexities of integrating software, services and support required to deliver improved user experiences, collaborative alliances represent the best and, maybe the only available path forward to create real and tangible user and customer value.